Thum! Kaun Aata Hai? : VRDE Developing Aero-Diesel Engine for UAVs - IDPS Exclusive! VRDE Developing Aero-Diesel Engine for UAVs - IDPS Exclusive! Vehicles Research and Development Establishment (VRDE), Ahmednagar, Maharashtra plans to develop an aero-diesel engine as UAV powerplant in collaboration with the Indian private industry. The DRDO establishment has invited Expression of Interest (EOI) from Indian Industry/Organization for Joint Development of 200 HP Aero-Diesel Engine with an installed weight of approximately 250 kg. The requirement is for a four stroke, four cylinder, inline arrangement, internal combustion, diesel engine fitted with propeller governor, turbocharger and 28V self starter, 5.6 kW alternator and FADEC controlled. Heavy fuels such as ATF K-50 and diesel have higher calorific value as compared to gasoline. Using a heavy fuel powerplant on a UAV can improve range and endurance. The downer is, HF engines weigh considerably more than gasoline engines. Israel has pioneered the use of heavy fuel engine as UAV powerplant. Israel Aircraft Industries (IAI) displayed its Super Heron HF UAS at Aero India 2015 in Bengaluru in February 2015. 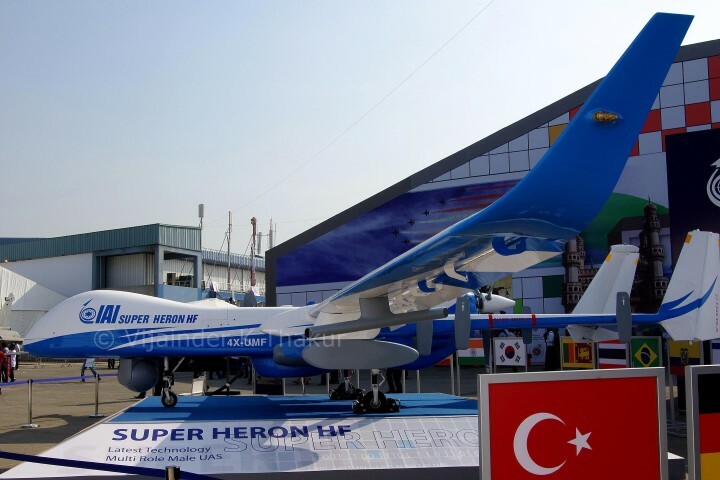 Super Heron, which was first unveiled at the Singapore Air Show in February 2014, has a heavy fuel 200 hp engine that increases its rate of climb and performance. Heron UAV - which is used by the Indian Army, Navy and Air Force - is powered by 1 × Rotax 914, 86 kW (115 hp) gasoline engine. Here is an interesting insight. The Rustom-2 MALE UAV under development by DRDO/HAL is currently powered by 2 x Rotax 914 engines, each driving a twin blade variable pitch propeller. Yes, its the same engine that powers the Heron, as also many other UAVs including the US developed MQ-1 Predator. A DRDO official told IDP Sentinel during DefExpo 2014 that a study is on to assess the feasibility of powering the Rustom-2 with a diesel engine. The similarity of the specs between the Super Heron HF engine and the one proposed to be developed by VRDE is interesting. It's early days in the development cycle, so any speculation on the eventual use of the aero-diesel engine developed VRDE would be highly speculative.